In this video we will discuss, configuring an asp.net core application using an environment variable. In most software development organisations we typically have the following development environments. Why do we need different Development Environments like Development, Staging, Production etc. "Something has gone wrong, please email, chat or call our application support using the contact details below"
In Part 8 of ASP.NET Core tutorial, we discussed ASPNETCORE_ENVIRONMENT variable. We use this variable to set the environment for our application. On our local development machine we usually set this environment variable in launchsettings.json file. 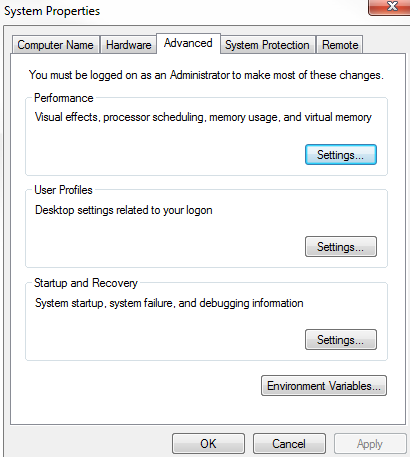 On a staging or production environment we typically set this environment variable in the operating system. We usually set this variable to one of the following values depending on the environment in which our application is hosted and running. Out of the box, ASP.NET core provides IHostingEnvironment service which we can use to access ASPNETCORE_ENVIRONMENT variable value. Take a look at the sample application we have been working with, notice the Configure() method in Startup.cs file. IHostingEnvironment service is already injected into this method. Now modify the code in Configure() method as shown below. Notice, we are using EnvironmentName property of IHostingEnvironment service instance to access the environment name. If you have the environment variable set in both the places i.e launchsettings.json file and in the operating system, then the values in launchsettings.json file overrides the value specified at the operating system level. If we have not explicitly set ASPNETCORE_ENVIRONMENT variable, it defaults to Production. This is done on purpose for better security and performance. Imagine, on a production server, we have forgot to set the ASPNETCORE_ENVIRONMENT variable to Production.If the default value is Development, the application may display Developer Exception Page and it could be exploited by a malicious user to hack into your application. Use the following methods of IHostingEnvironment service to identify the environment in which our application is running. What if you have a custom environment like UAT (User Acceptance Testing) or QA (Quality Assurance) environment. Well, custom environments like these are also supported in ASP.NET core. For example, to check if the environment is UAT, use IsEnvironment() method as shown below. Tag Helpers are new in ASP.NET Core. In a razor view ie. in a .CSHTML page we can use, something called an Environment Tag Helper. This environment tag helper supports rendering different content depending on the value of the ASPNETCORE_ENVIRONMENT variable. We will discuss Tag Helpers including the environment tag helper in detail as we progress through this course and create Models, Views and Controllers for our application. First Of all , Thank you very much creating the videos on asp.net core. and as per this video, i created a environment variable on system level and restarted the visual studio. Even though I am seeing the environment value from launchsettings only. Hello, launchsettings have high priority so it will override the value environment variable.